James Maddison has impressed since stepping up from the Championship. The Foxes chief wants the 22-year-old to focus on his club football after a return to form against Watford. The midfielder scored a brilliant volley in Saturday’s 2-0 win – his first goal for over two months which came after he was sent off for diving at Brighton last weekend. 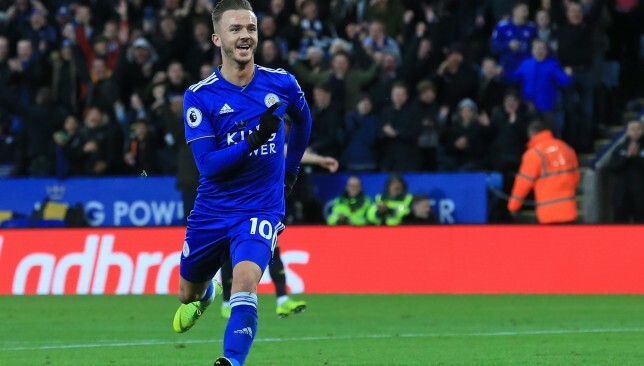 Maddison was called up for England’s Nations League games against Croatia and Spain in October but did not play and Puel is eager for his star to keep focused. He said: “It’s not important for the moment. He needs to follow his way, follow his improvement. “If he gets selected it would be good for him but selection or no selection wouldn’t change anything about his improvement and what he needs to continue to perform. “The sending off was a good thing for him, to take the right decision,” the Frenchman added. “He was very upset with himself and he’s a very intelligent player so when he plays with this attitude and the right mentality he is a fantastic player. Maddison added to Jamie Vardy’s early penalty to lift Leicester to eighth in the Premier League while Watford had Etienne Capoue sent off late on for a challenge on Kelechi Iheanacho, though the Hornets will appeal. Arsenal are struggling to keep up with north London rivals Spurs. 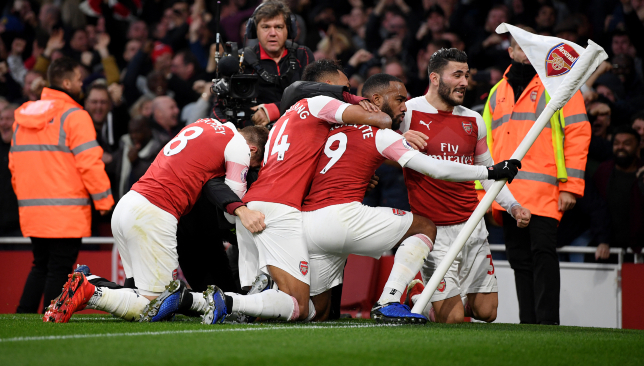 Arsenal moved above neighbours Tottenham and into the Premier League’s top four after winning an enthralling north London derby that was overshadowed by trouble in the stands. 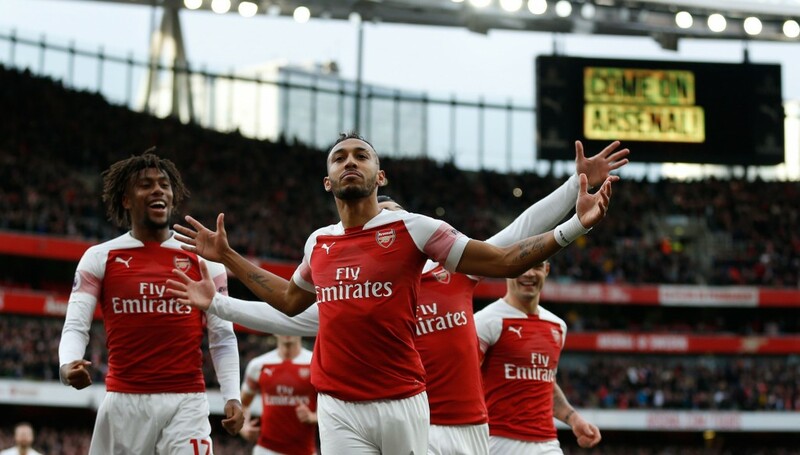 The Gunners ran out 4-2 winners in a memorable meeting at the Emirates Stadium on Sunday, with Metropolitan Police afterwards confirming there were seven arrests made. It is understood one of those arrests came after a banana skin was hurled from the away end as Pierre-Emerick Aubameyang celebrated scoring an early penalty in front of the Tottenham fans. 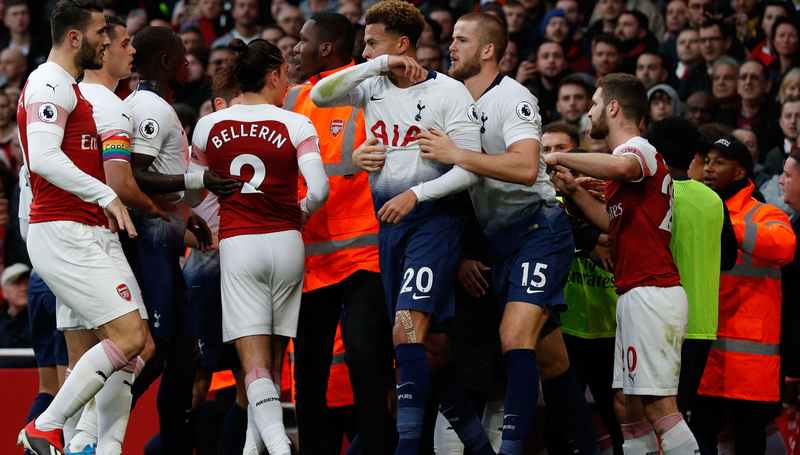 There was trouble in the north London derby, with one arrest believed to have been made after a banana skin was hurled from the away end as Pierre-Emerick Aubameyang scored. The Gabon forward went on to equalise, with Arsenal wrapping up the points through Alexandre Lacazette and Lucas Torreira strikes. Tottenham defender Jan Vertonghen, who had conceded the early penalty for handball, was sent off late on for a second yellow card to round off a forgettable afternoon for Mauricio Pochettino’s side. The win sees Arsenal move fourth, ahead of Spurs on goal difference, with Unai Emery now focused on another testing examination away at Manchester United in midweek. “Now I am thinking of the match on Wednesday in Manchester,” he said. “It is a very big victory, we showed our supporters and we gave them the victory because it is a very special match against Tottenham, for us it is special also. Arsenal moved above their rivals following a thrilling 4-2 win. Pochettino ran down the touchline to help calm matters, with Dier afterwards defending his own actions in the incident. “I had my back to it all so I’m not too sure what happened,” he said of the scuffle. “But this is football. It’s a derby. football is all about emotion and I don’t understand how I can get a yellow card in that situation. “It baffles me because if you take the emotion out of football you’re going to destroy the game for everyone. “The ref said he gave me the yellow card because it was because of me that the whole thing started. “If you watch it, we’re celebrating, I don’t leave the pitch at any point and some of their players that are on the bench come to us. The Argentina international was held out of Saturday’s 3-1 win over Bournemouth with a muscle injury, and he is doubtful to face Watford and Chelsea this week after Pep Guardiola revealed club doctors warned him Aguero could be ruled out until January if he aggravated the problem. City’s all-time top scorer therefore seems unlikely to make the trip to Vicarage Road on Tuesday or Stamford Bridge on Saturday. 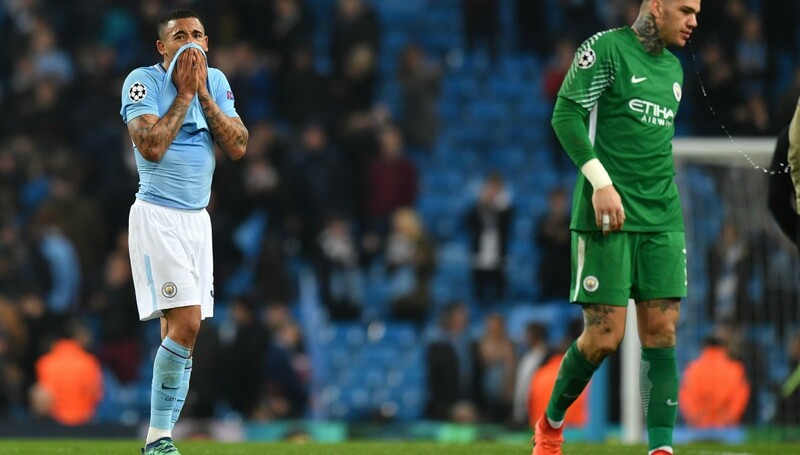 Gabriel Jesus has been in poor form in front of goal for Man City. Gabriel Jesus started against Bournemouth in Aguero’s absence, but was unable to get on the scoresheet. 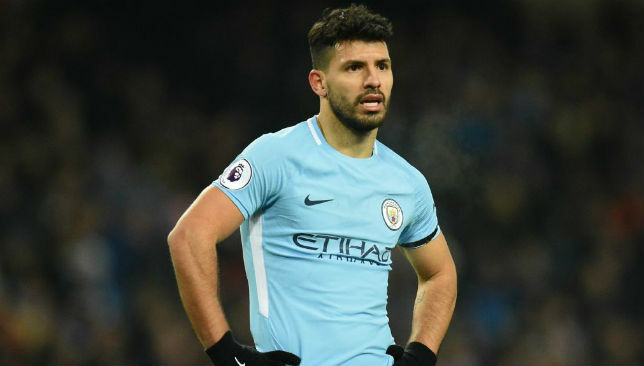 Aguero’s form has limited his playing time of late, but the 21-year-old said he was ready to contribute if needed following his own injury concerns which saw him miss last week’s Champions League win over Lyon. “I’ve been training really hard, maybe that’s why I felt something in my groin last week,” Jesus said. “Unfortunately I was out of the Champions League match that I really wanted to play. 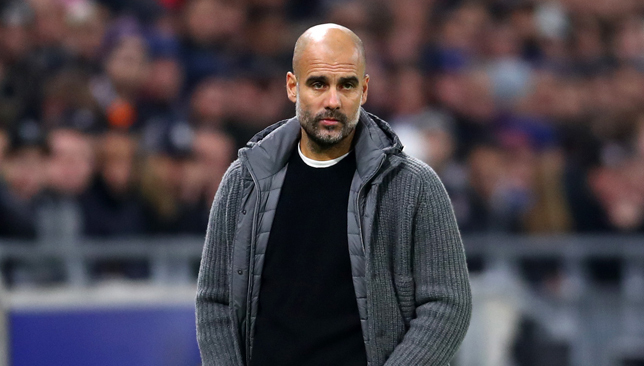 For his part, Guardiola praised Jesus’ all-round contribution against Bournemouth and said he had no concerns that the Brazil international’s goal drought would continue much longer. “We just relax,” Guardiola said. “It’s work, this work ethic he has. Always I said to him: when you work like he works on the pitch, always we will sustain him. We will always be there.